New Directions Publishing Corporation, 9780811214575, 189pp. 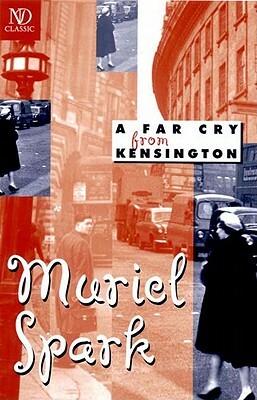 Mrs. Hawkins, the majestic narrator of A Far Cry from Kensington, takes us well in hand, and leads us back to her threadbare years in postwar London. There, as a fat and much admired young war widow, she spent her days working for a mad, near-bankrupt publisher ("of very good books") and her nights dispensing advice at her small South Kensington rooming-house. At work and at home Mrs. Hawkins soon uncovered evil: shady literary doings and a deadly enemy; anonymous letters, blackmail, and suicide. With aplomb, however, Mrs. Hawkins confidently set about putting things to order, little imagining the mayhem which would ensue. Now decades older, thin, successful, and delighted with life in Italy -- quite a far cry from Kensington -- Mrs. Hawkins looks back to all those dark doings, and recounts how her own life changed forever. She still, however, loves to give advice: "It's easy to get thin. You eat and drink the same as always, only half....I offer this advice without fee; it is included in the price of this book." A masterwork by "Britain's greatest living novelist" (Sunday Telegraph, 1999), A Far Cry from Kensington has been hailed as "outstanding" (The Observer) and "wickedly and adroitly executed" (The New York Times). "Far Cry is, among other things, a comedy that holds a tragedy as an egg-cup holds an egg" (Philadelphia Inquirer).